What can one do with Alpemix? Present your product demos remotely without going on-site of your customers. Keep on working on your PC at home by remote connection to your computer at work. Provide training for your colleagues about a computer software in which you are specialized. 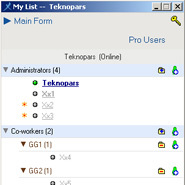 Discuss with your multiple colleagues in different places on the same computer screen. Define all of your employees in a certain hierarchical structure and enable them to make voice communication, correspond, transfer files, whiteboard. Easily connect your PCs constantly online and where nobody is on at any time you want. If one of the below written scenarios is familiar with you, the fastest and easiest solution is Alpemix for you! I want provide technical support to my customers from where I am. One of my remote friends is having problem with his computer and asking help from me. But I can’t help him due to his poor remote computer knowledge. When I am outside, I want to reach my home computer and make operations as I am at home. I should be able to perform file transfer between my two computers safely when necessary. I want to make my products’ demo to my customers in different countries and different cities through my won computer without going near them. I have too many customers. And I have more than one employee providing technical support. My employees and customers should not spend their time for logging up to somewhere and adding each other to their lists. I should be able to determine their user names and passwords. And when they log in with these user names, my customers should be able to see all my technical support providing employees and get easy support. There is a project we still work on it. My team mates and customer are in different cities. We need to discuss about project drawing and exchange information. I know some computer programs very well and I want to give remote lessons to my three friends about this issue. Audio communication option should be available during lessons and my friends should be able to show the question they want to ask at anywhere on the screen during my speech and I should be able to allow my friends to repeat everything I do on my screen. Units of our company are located in different buildings, different cities and different countries. My employees even located in different countries should be able to get support from my own information processing employees. My employee should be able to perform safe file transfer and discuss our project on the same screen. My employees must be able to access other employees of our company easily with the user name and password to be determined by me without requiring logging up to anywhere. You can do all these operations with Alpemix without making any settings in your system. Do you know any other software providing all these together? You can get access to your customers in 4 different ways through Alpemix. You can define a user name and a password for your customers.Your customers will log in with that user name.Your authorized operators can get connected with you customers by sending offers. Alpemix is a strong application that provides the chance of realizing all issues such as remote support, presentation, maintenance, education, meeting. Two ends that will establish the connection, even firewalls are behind NAT devices, Alpemix establishes peer to peer connection with the opposite side. You do not need to maje any settings in your system. 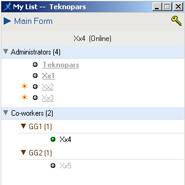 You can use Alpemix easier by adding your friends, work mates, customers to your list. With few clicks, you can instantly use file transfer, audio communication, presentation, support, instant messaging functions with persons in your contact list. 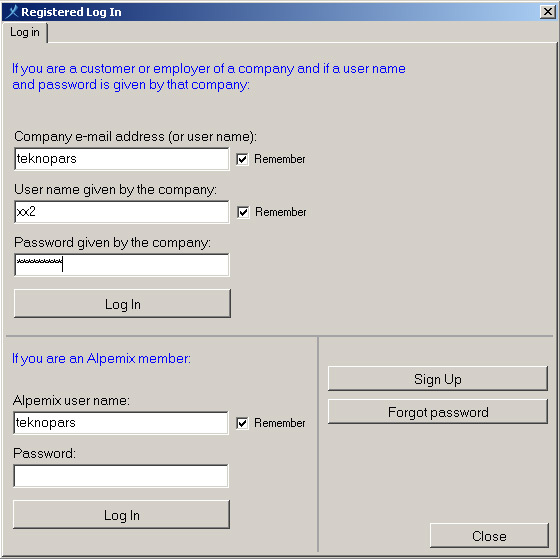 Your customers can use Alepmix with user name and password determined by you without logging up to the system and request support. You can use instant messaging option while providing remote presentation, education and support with Alpemix. With advanced file transfer option, you can transfer files and directories plain head to opposite side or load them to your computer. Automatic compression and encýding is used for transfer. You can perform file sending and receiving operation safely and rapidly. While providing support, you can make your presentations vocally. More than one persons discussing on the same screen can use audio communication option at the same time. When new options are added to Alpemix, it refreshes itself automatically within a few seconds. Thusi you do not encounter a problem such as version incompatibility. And you will have the chance to use new options instantly without paying any fees. Alpemix software can be used in 5 different languages. The operation language is determined automatically by the operating system language option and IP address. If desired, the user can also choose it from the menu. You can identify sub-users with different authorization levels. If you wish you can enable the user to see, not the whole but a part of your screen. You can realize more than one remote desktop connection simultaneously. Each connection is shown on a separate window and for each connection separate settings can be configured from the menu. The image of the computer you connected is sized automatically according to the resolution of your screen and it is shown on your screen. You may display the image larger or smaller or provide the display in the actual dimensions. 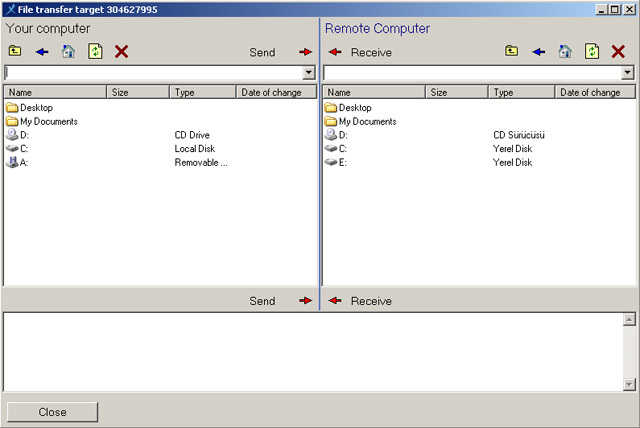 Alpemix provides direct (p2p) connection of two computers to each other in the remote desktop connections. You can copy and paste text expressions from the computer you are connected to your computer or from your computer to the computer you are connected. Licensing is made on behalf of the user as independent of the computer. As a result, you can use pro user right from any computer you desire without any need for configuration of the settings. 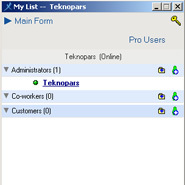 You can message with persons in your list with the contact list and connect to computers of these persons by requesting confirmation with single click without spending time for giving ID and password. 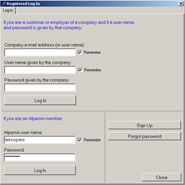 With an user name as a company (or person) you can log up to Alpemix and define all your users. No need for logging up all your customers, personnel and friends to Alpemix. They can log in with the user name and password defined by you and reach to you instantly. It is automatically determined that which groups will see whom. You can not find these opportunities in another software! As soon as the program initiated, an ID and password only for you will be shown on the screen. Each time you initiate the program, ID and password is renewed. In order to provide the opposite person connect to you for support or presentation, you should give your ID and password to that person. If you want to connect to a computer, you should enter ID and password created in that computer to the area on the right of the screen and click on “Connect for Maintenance” or “Connect for Viewing Presentation” options. Image of each computer you are connected is shown on your screen with a seperate window. You can see all connection on the righ bottom of the screen out of connection Windows and you can make settings from that section. You can also see other persons connected to the screen you are connected to from the same section and you can chat with them in the “Chat” section. You can make audio communication with all participants with the audio communication option. You can make settings fort hat connection from the “menu” section located on thje right top part of the window showing the image of the computer you are connected to. You can see directory structure of the opposite computer with file transfer window and also get around between directories. As got around directories, the person sitting at the computer you are connected with the same screenshot sees your operations visually. With few clicks, you can transfer directories and files from your computer to that computer or to your computer from a remote computer. You can perform a rapid transfer in high security with encoding and compression methods used in transfer. You can query the connections based on the date of connection and many other criteria (user name, IP address, single number, time, quantity, etc.). 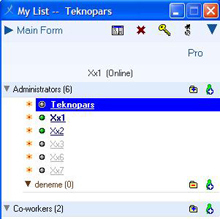 For example, you logged up to Alpemix with the user name “Teknopars”. You clicked on “Registered Usage” from the main program and the screen revealed on the top left. If you are the Alpemic member under this form: “you wrote your user name and password in the section that include the topic and click “Log In” button. And the screen revealed at the second image above. As you see, your sub – users are not defined yet. 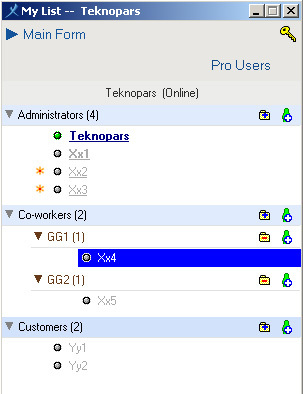 And there are three main groups as “Administrators”, “Co-workers” and “Customers”. You can add sub – group or users by clicking on icons located at the right of main groups. You determine the user name and password. 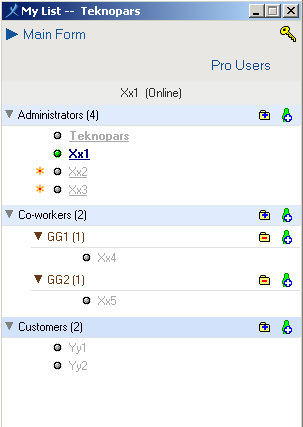 It is seen that 1 super admin (Xx1), 2 admin (Xx2, Xx3), 3 Co-workers and 2 customers are defined in the third image. Also Pro user right is given to Xx2 and Xx3. 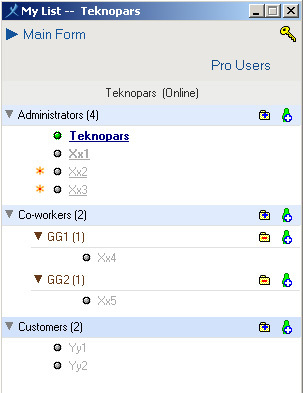 And “GG1” and “GG2” sub groups are added to “Co-workers” main group. Now see how you will log in with that determined user name and password. 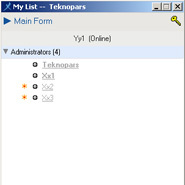 As it is seen on the image at top left, log in to list will be done from the top section of the screen due to being a sub user. And we write company’s e-mail address registered in the system or the main user name to “Company E-Mail Address” section. 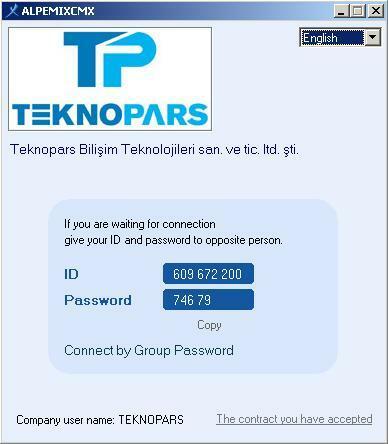 In this example, we wrote teknopars because the main user name is “teknopars”. We will log in with “Xx1” one of the users we defined. We write the password determined for “Xx1” sub user and click the “Log In” button. And we see the screen on the second image. 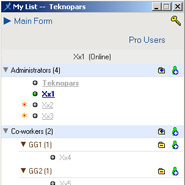 Xx1 can see all main users and users in these groups in its list because it is created as a user of “Administrators” main group. And due to being created as “Super Admin” it has many authorizations such as adding new persons, adding sub groups, deleting user, assignin pro user, etc. 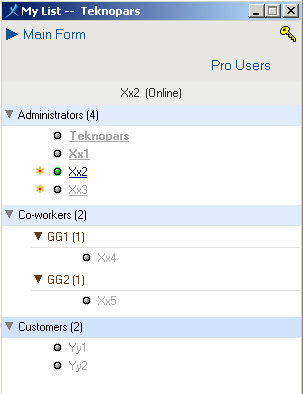 As shown on the image, entrance to list is performed with “Xx2” user name that is added to “Administrators” group. 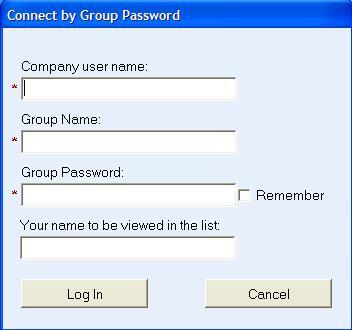 It can see usersin all groups due to being a user of authorized persons group. But it can not perform transactions of “Super Admin” user such as user defining, adding sub group, etc. 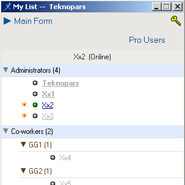 As shown in the image above, entrance to list is being done with “Xx4” user name that is added to “Co-workers” group. When users in this group logged in, they can not see “Customers” group. You gave your customers their user name and passwords. Now, they can easily reach to one of their authorized persons. As shown on the first image above, entrance to list is being done with “Yy1” user name that is added in the “Customers” group. 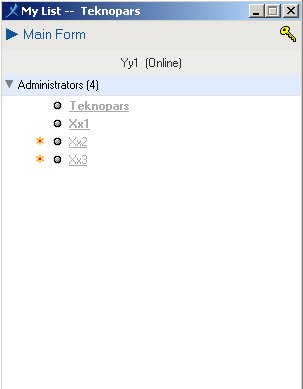 As it is seen in the second image, users in this group can only see users in the “Administrators” group. They also can not see customers in their own group. With Alpemix software, it is impossible to view a computer without permission. Alpemix software does not have a specification such as operating at backgroung, hidden operation as service, operation without seen on the screen. All performed operations are shown on the screen and they are closed when you close the program and does not have any validity anymore. Alpemix does not require any installation. It will be completely removed when you delete .exe file. So, it is impossible for anyone to view your computer with Alpemix without your permission. Each time Alpemix program is initiated, a new ID and password will be generated. 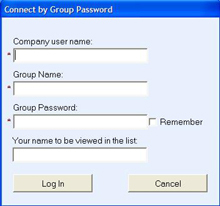 Thus, when you close the program, ID and password that you gave to your contact for a connection will be invalid. When you initiate it again, a different ID and password will be valid. Alpemix main server audits connection attempts done with ID and password. It detects multiple ID / password attempts and cuts connection of that computer or completely blocks. You just want to view presentation of opposite person or you just want to make presentation. In this case, you can give the password that is created for presentation to the opposite person and prevent accidental or purposely connection in support mode. 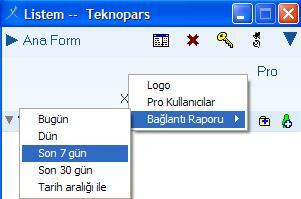 A person that you do not know can not add you to his / her list in the communication thorugh list. You can communicate with only persons you know without giving ID and password. A confirmation will be requested from the opposite person for connections to be established for support or making presentation. Alpemix software is signed with “VeriSign Code” signature product. So that the manufacturer of the software can be defined as open and safe. Both in peer to peer remote computer connection and all communication between your computer and Alpemix main server are encoded in high security level. RSA is used for key transfers. AES (256 bit) is used for encoding instant data. RSA for key transfers and AES for instant data transfers are accepted as completely safe according to today’s standards. It is impossible for another person who intervene in communication to decode all data because personal key client is never seperated from the computer and strong encoding standards are used. 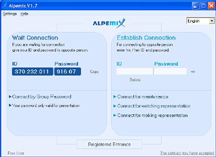 When you establish a remote computer connection in the same way, Alpemix main server can not decode the communication between you and the other computer. Keys created by the client are not saved in the client computer. Because different keys are created at each time program is initiated. For key transfers, 1024 bit RSA and 256 bit RSA are used. The key that is encoded with 1024 bit RSA can be sent directly. The key that is encoded with 256 bit RSA is not sent directly. The key that is encoded with 256 bit RSA is sent again after being encoded with 256 bit AES. Each client program knows the pre-defined RSA 1024 bit public key of Alpemix main server. When Alpemix initiated, instantly 2 pieces 256 bit AES keys and 1 piece RSA 256 bit public / private key pair is created. Then, it encodes one of created AES keys and the created RSA public key with server’s public key by making 1024 bit RSA encoding and transfers it to server. The server that receives data, decodes the encoded data by using RSA 1024 bit private key. So that, it knows the RSA public key and initially created AES key of the computer connected to it. The second created AES key is not known. After that moment, it processes all data coming from client by decoding with known AES key. 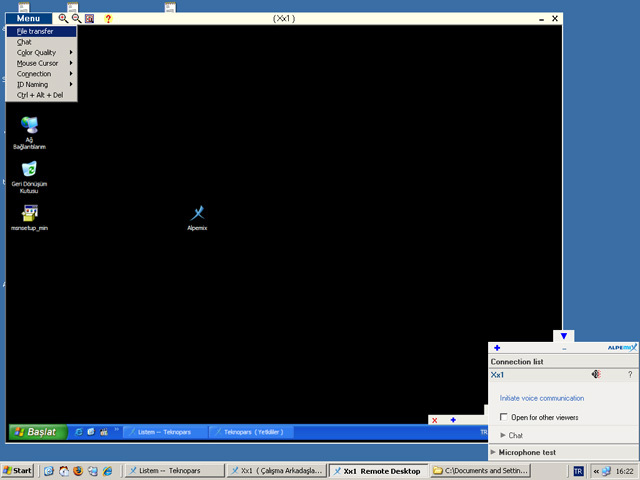 Again, it sends all data to be sent to client by encoding with AES key created by that client for the server. Let’s call this first AES key created by the client as AESKey1. The second AES key created by the client at the opening is used for peer to peer communication with other clients. Let’s call this AES key as AESKey2. In order to connect Computer B to Computer A and perform encoded communication; A must know B’s AESKey2 value and B must know A’s AESKey2 value. While these values are sent to each other through the server, the server should not see or decode these values. First of all A states the server that it wants to connect to B. At this point, it should be remembered that communication between server and client is done with AESKey1 value assigned for each client cyriptically. The server receiving the request, sends B’s public key to A and A’s public key to B. Now A and B know each other’s public keys. A encodes its own AESKey2 value with B’s public key by RSA 256 bit and sends to the server. Each package sent to server is encoded with AESKey1, so that this data is sent to server by being encoded with AES 256 bit. Server opens each package coming from the server with AESKey1, so it also opens that package. And it encodes the first package with B’s AESKey1 and sends to B. Server does not know B’s private key, so it can not completely decode password of the package. Thus, it does not have the chance to see A’s AESKey2 value. B receives that package sent by the server and applies the operation that is applied to all packages received from the server. That means, first it opens the package with its own AESKEY1 value. In this way, B knows A’s AESKey2 value. By applying same methods, B’s AESKey2 value is known by A. Henceforth, A and B encodes the package with each other’s AESKey2 value when they will send direct packages to each other. Easily connect your PCs where nobody is on. You can easily integrate Alpemix to your own software. Block the connections external to the company.